Aiseesoft iPod Video Converter for Mac is a professional Mac iPod Video Converter designed only for Mac users.With the powerful conversion function, Aiseesoft iPod Video Converter for Mac can convert almost all the popular video and audio format such as MPG, MPEG, MPEG2, VOB, MP4, M4V, RM, RMVB, WMV, ASF, MKV, TS, MPV, AVI, 3GP, 3G2, FLV, MPV, MOD, TOD, etc to iPod supported video/audio format. ...... 3G2, FLV, MPV, MOD, TOD, etc to iPod supported video/audio format. Aiseesoft iPod Video Converter for Mac enables you to pick up any part of the video you like, crop the video and remove the black edges. You can also put several videos into one output file with the best iPod video converter for Mac. 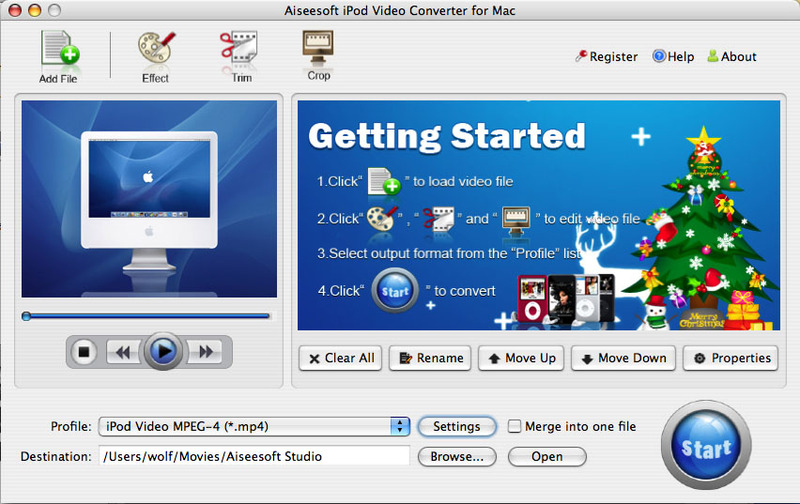 Aiseesoft iPod Video Converter for Mac can convert almost all the popular video and audio format such as MPG, MPEG, MPEG2, VOB, MP4, M4V, RM, RMVB, WMV, ASF, MKV, TS, MPV, AVI, 3GP,3G2, FLV, MPV, MOD, TOD, etc video and AAC,AC3,WAV,MID,WMA,M4A,RA,RAM??? audio to iPod supported video/audio format. With the best Mac iPod video converter you can output iPod videos for iPod, iPod Nano 4, iPod Touch, iPod Touch 2, iPod Classic, iPod shuffle, iPhone and iPhone 3G. iPod Video Converter for mac can convert AVI, MPEG WMV to MP4 for iPod format. iTool iPod Video Converter for MAC can convert video to iPod video format. It can convert popular video formats to iPod video and audio files to iPod MP3. Convert popular video formats to iPod MP4 and audio files to iPod MP3 with ease. Convert almost all videos to MPEG-4, MP3, WAV, M4A for playback on iPod. Convert video and audio files to iPod Touch, iPod Classic and iPod Nano. Qweas is providing links to Aiseesoft iPod Video Converter for Mac 3.2.18 as a courtesy, and makes no representations regarding Aiseesoft iPod Video Converter for Mac or any other applications or any information related thereto. Any questions, complaints or claims regarding this application Aiseesoft iPod Video Converter for Mac 3.2.18 must be directed to the appropriate software vendor. You may click the publisher link of Aiseesoft iPod Video Converter for Mac on the top of this page to get more details about the vendor.